Few books provide such immediate and practical help in ministry. It deals with the church as both organization and organism. “Leadership in the church has a two-fold function, both elements equal in importance. One focuses on task . . . the other relationships.” function, both elements equal in importance. One focuses on task . . . the other on relationships.” I found two things especially refreshing about the book. First, was his condemnation of manipulative techniques. 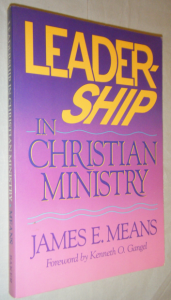 “A leader is one whom others will follow willingly and voluntarily.” The second was his warning to “chose carefully the hills (issues) upon which you wish to die.” The book is written from a Baptist perspective of church government, it is saturated with Scripture, and has many helpful suggestions for those in church leadership. I highly recommend this book to every pastor and consider it must reading for our future leaders.